Please take a few moments to browse our frequently asked questions section as many of your queries can be answered within this area. If your question is not answered please contact us. How long can I get license code after submitting the order? Generally you can receive an email includes license code 15 minutes after submitting the order. If you still don't receive the license code after 12 hours, please contact us at sales@driver-soft.com. Besides, please add sales@driver-soft.com to white list to ensure you can get our email if your mailbox has anti-spam function. How can I get back my license code if I lost it? Please send your order ID to sales@driver-soft.com, we will send you an new code. If your order ID is lost either, please tell me which site you bought Driver Genius and your name, email address that used to register etc. We'll send you a new code after checking order record according these information you offer. How can I upgrade to the latest version program? I've bought previous version Driver Genius. It is free to upgrade for the first one year. We will send you the new code when releasing a new version program. Attention: If you changed email address, please send email to sales@driver-soft.com to notice us. We'll renew your order record. If you've used Driver Genius for more than one year, please send your order id or the old registration code to sales@driver-soft.com, we'll give you a link to purchase the new version program. You can get 30% or even higher percent discount. How to enter the license code? Click 'Help' menu -> 'Enter Code... ' or just click the 'Enter Code' button in the lower left corner. My license code is invalid, why? Please notice that your license code must match with program version. For example: the license code of Driver Genius Version 14.x can't be used on version 15.x . To check the version of current program used, click 'help' menu and choose 'about'. Please keep in mind that both license name and license code are case-sensitive, you'd better copy the license information then paste them to the registration form just in case. What systems can Driver Genius work on? Driver Genius can works on Windows 2000, Windows XP/Vista/7/8/8.1/10 (32bit & 64bit), Windows Server 2003/2008(32bit & 64bit), Windows Server 2008 R2/2012 R2. Driver Genius doesn't support Windows 95/98/ME/NT, Macintosh, Unix or Linux. Why Driver Genius can't boot up properly? 1. Before installing Driver Genius, please uninstall the old version one first. 2. If your OS is Windows 2000/XP/Server 2003/Vista/7/8/8.1/10, please make sure that you have administrator right. Why does my antivirus report that has found an infected component inside Driver Genius setup file. Some antispyware, antivirus or antitrojan programs can detect Driver Genius as being infected or possibly infected with a form of badware (virus, spyware), although the application runs perfectly safe and does not pose a threat to your system. This type of reading is called a "false positive" and it occurs when antivirus software wrongly classifies an inoffensive (safe) file as a virus. The incorrect report may be caused by heuristics or by an incorrect virus signature in a database. Driver Genius is 100% clean green software, never including any viruses or spy adware. We use the ASProtect SKE to pack Driver Genius. That is the reason some antispyware, antivirus or antitrojan programs send out the virus warning. It is absolutely a false positive. I have backed up drivers on Windows XP, can I restore them on Windows Vista/7/8/10? Unfortunately you can't. Although there are some drivers that can both work fine on Windows 2000 and Windows XP. Most drives can not work on different operating systems. I have backed up my drivers to an EXE Auto-Installer on Windows Vista, why I can't execute it? You must run it as administrator. Please right click the EXE Auto-Installer, choose 'run as administrator'. Windows has already installed a driver for my hardware, should I need update it? Drivers provided by Windows can only offer basic device performance. To get optimal performance, you must install the latest version drivers provided by their hardware manufacturer. The most important thing to notice is that the drivers provided by Windows do not contain a control panel for hardware configuration. For example, if you don't install the latest version drivers provided by the manufacturer for video cards, you can't configure the OpenGL and Direct3D options for the video card. This can obviously lower video quality and FPS of 3D images in games. The same thing will happened on sound card, Windows drivers can't offer EAX sound effects, 3D sound effects, or Dolby multi-channel surround stereo. So install a suitable driver will enhance the full performance of system. I have downloaded and installed the most recent version drivers provided by Driver Genius all, but the program still prompted me to update drivers. In our previous version Driver Genius, if you have installed the latest drivers for a device but this driver will still appears in the update list. This problem is caused by those big driver packages. The driver package contains multiple device drivers. 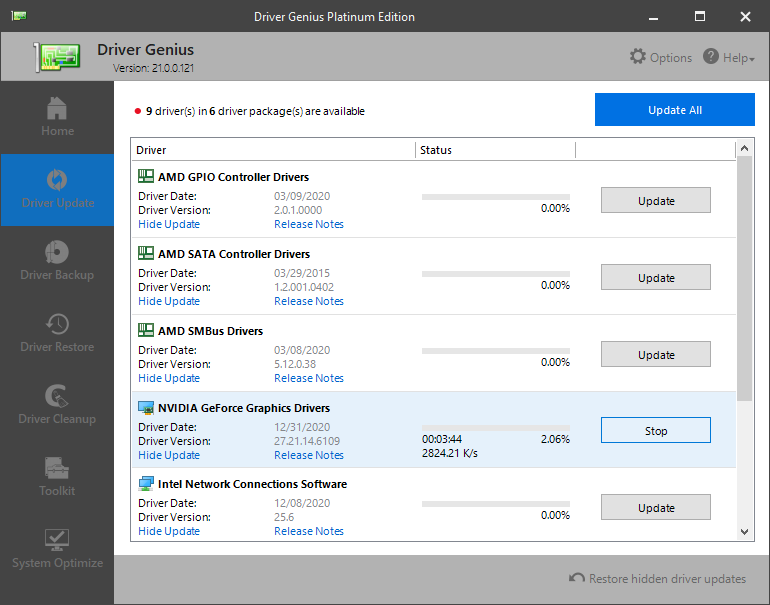 Driver Genius determines whether the drivers should be updated or not by comparing the driver date and driver version in our current drivers database. But, there are more than one driver in some big driver installation package released by the hardware manufacturers. For example, Intel Chipset Software Installation Utility and VIA Hyperion Pro Driver include AGP controller, IDE controller and USB controller driver and so on. In this situation, Driver Genius is unable to determine whether the drivers are installed correctly or not. To prevent downloading repeatedly, We hide those drivers after users install them by choosing 'install' button in Drivers Download Manager. The program won't prompt to update those drivers until their newer version one released. Of course you can also restore them manually at anytime by click the 'Restore Hidden Driver Updates' button. Some 7z packed format drivers can't be downloaded successfully or download repeatedly after reaching 100%. That may be caused by a certain damaged system file. Driver Genius can't get the 'MD5' code of your system. You need to fix Microsoft Cryptography to solve the download problem. 1. Rename the folder 'RSA' C:\Users\Your User Name\AppData\Roaming\Microsoft\Crypto to 'RSA.bak'. 2. Load Driver Genius to update the driver again. Commonly, most of drivers can be installed silently by Driver Genius after clicking the' Update All' button. But some drivers just can't be installed silently because of their own reason.? For example, the Realtek Cardreader driver. This drivers can't be installed silently by Driver Genius, you have to install it manually.Click the 'Install' button after the driver was downloaded completely, then leave the rest to Driver Genius. The program will install the driver automatically at this moment. I can't download driver update. 1. Please change your firewall settings to ensure Driver Genius can access internet correctly if you have firewall software installed. 2. Download server may be busy. Please try again later. I've shut down Driver Genius before downloading drivers completely. How can I resume the unfinished download mission? Click 'Start Scan' button in the Home window of Driver Genius, the program will scan and list all driver updates for your computer again. The previous driver will be replaced if a newer version driver has been released during this time. Driver Genius prompt that there are 8 devices drivers need updating, only 4 drivers left in download list after choosing them all to update. Why? Because some driver packages contain multiple device drivers such as motherboard driver, it contains AGP controller driver, USB controller driver and IDE/RAID controller driver.